The education world says instruction should be 'data driven,' but unfortunately, many administrators and teachers have little experience with conducting an exam autopsy analysis. 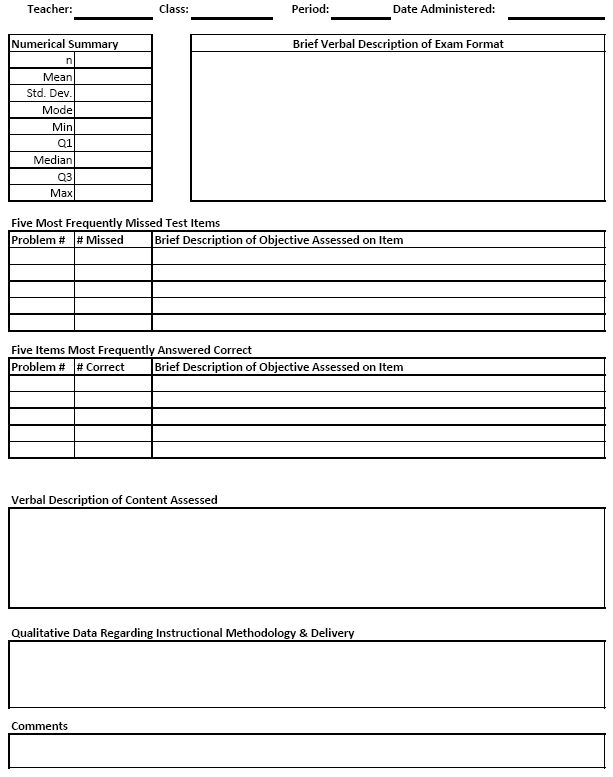 Below is a copy of the form I made and use to analyze data from assessments for unit exams. I shared this form with my department last year. We used it to analyze midterm and final exam data. Feel free to share this form with others. Here are some things I think about when I use the form above. Numerical summary: I type the student's grades sorted in ascending order (without identifiers, of course) in Geogebra. I prefer to make a dotplot and a boxplot to display for students on the Promethean board. We use the quartiles to make verbal statements about performance: "Looks like the first quartile is 71, so 75% of the class scored a 71 or better." I can have powerful conversations with my students about analyzing data given their emotional investment in their own performance. I can ask questions like: "Which is preferable? An exam with a middle of the road mean and low standard deviation, or an exam with a decent mean but high standard deviation?" Brief verbal description of exam format: I prefer a balanced approach between different question types, such as multiple choice, short answer, true/false, matching, and sequencing questions when possible. If I see poor performance for a whole section, I might reflect on whether to change the question format in hopes to capture more information to assist my diagnosis of student misconceptions or misinterpretations. Five most frequently missed test items: To conserve class time, I prefer to spend time answering only the most frequently missed test items. If a student has another question, I encourage them to visit with me outside class. If I see a recurrent theme in the content of missed items, I know I probably need to revisit my lesson plans and unit activities to try and isolate the cause of the misconceptions. Five items most frequently answered correct: We all need to try and catch kids in the act of doing things right. However, if everyone is getting an item correct, I might need to ratchet up the item difficulty or ask a deeper question. Verbal description of content assessed: I have this information for my own reference. I use it to aid my construction of learning guides (some refer to these as curriculum maps or pacing guides). Qualitative data regarding instructional methodology & delivery: I make notes of the instructional techniques I used during the unit. These may include guided lecture, partner work, small group work, cooperative formative assessments, writing tasks, and other instructional strategies. If students struggle mightily on an assessment, I may need to examine my delivery of the unit and make modifications to the activities to increase the probability of student retention. Comments: This is the field I reserve for logistic issues going on at school. Perhaps an unannounced fire drill takes place 20 minutes into the exam. Maybe we are on shortened schedule for a Homecoming assembly. Perhaps the students mentioned having tests in almost all their other classes on that given day. All of this information is useful for the planning and preparation phase of teaching. Posted in Assessment, Instructional Strategies, Professional Development, Teacher Resources on October 9, 2013 by Shelby Aaberg.